Take these spicy fried drumsticks to a party or picnic, or enjoy them as a main dish along with coleslaw, potato salad, and baked beans. The recipe calls for drumsticks, but feel free to use whole chicken legs. If you have some chicken wings or thighs, fry them as well. Just remember to reduce the cooking time for smaller pieces of chicken. If you regularly buy budget-friendly frying chickens and cut them up yourself, you might like to save the breast and thigh meat for casseroles, salads, sandwiches, and pies. This recipe is an excellent solution for using the drumsticks. 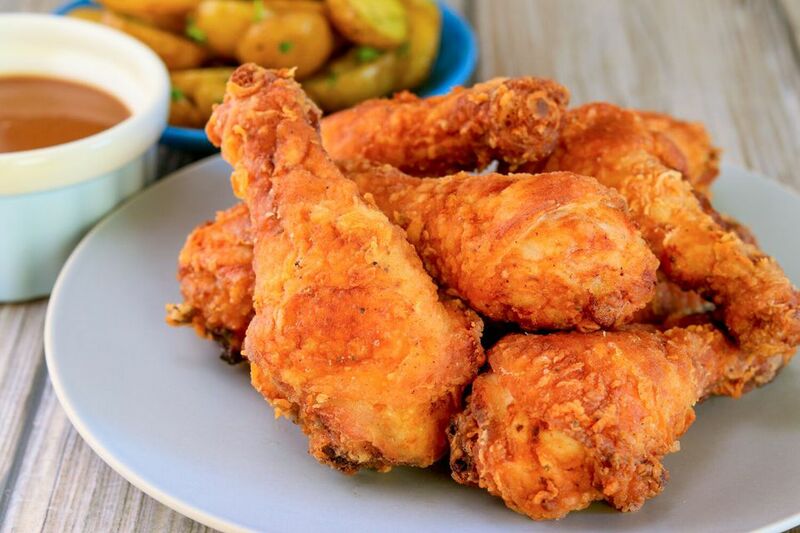 Drumsticks are an excellent party food because there's no need to provide utensils. Plus, they're meatier than wings or drumettes. Just make sure you have plenty of napkins for guests. The recipe makes enough for sixteen appetizer servings or about eight main dish servings. It's easily scaled down for a small family, or double the ingredients for a crowd. Heat the warming drawer or oven to 200 F.
Pat the chicken with paper towels to dry. In a large bowl, combine the buttermilk, Tabasco sauce, salt, and 1 tablespoon of black pepper. Add the chicken legs to the mixture and toss to coat. Cover and refrigerate with the marinade for at least 1 hour (or up to 24 hours). Remove the chicken from the buttermilk and let any excess buttermilk drip off. Combine the flour, additional 1 tablespoon black pepper, and the cayenne. Shake the chicken legs in the seasoned flour and place on a rack while waiting for the oil to heat. In a large, heavy saucepan or deep skillet or sauté pan, heat at least 3 cups of oil to about 365 F. Fry the chicken legs in batches for about 10 minutes, turning once. To check for doneness, use an instant-read food thermometer inserted in the thickest part of the largest drumstick, not touching bone. The minimum safe temperature for poultry is 165 F.
Remove the chicken to paper towels to drain. Place the drained chicken on a baking sheet, cover loosely with foil, and move to the warming drawer or oven to keep warm while frying subsequent batches. In deep-frying, the food is completely immersed in the oil, while in pan-frying the food is placed in enough oil to cover the bottom and sides, making it necessary to turn the pieces over to fry both sides. Three cups of oil will give you a depth of 1/2-inch in a deep 10-inch skillet and is sufficient to pan-fry.